Last December I suggested making tuiles out of glacier mints. This year, in my seemingly endless and slightly pointless quest to make tuiles out of unlikely things, I've used Crunchie bars. (In case you've never heard of them, Crunchies are chocolate coated honeycomb bars). Honeycomb tuiles have turned up on the menus of many a fine restaurant but this is the downmarket version. It’s a quick and easy way to produce very tasty, very sweet tuiles that will make a simple dessert a bit more special. Make sure that your Crunchie bar or bars are cold, break them up a little and place in a food processor or blender. Blitz them until they're reduced largely to powder, although a few slightly bigger bits can add a nice contrast. Preheat the oven to 170°C. Avoid using a fan setting if you can because it might spray the powder around the oven. Line a baking tray with a silicone sheet or some very non-stick paper. Spread a layer of the smashed up Crunchie bar onto the silicone sheet. The layer should be reasonably even and thin but don’t make it too thin or the tuiles will be impossibly fragile – around 2 or 3 mm will be about right. The tuiles will be a little neater if you make a template out of card or a piece of spare silicone sheet when you spread them onto the baking sheet, but it’s not essential. Remove the template, place the tray in the oven and bake the tuiles until they melt and merge together but before they start to burn. Somewhere in the region of 2 to 5 minutes should be enough. Test by touching lightly (carefully, they're hot) – if they feel relatively firm and no longer like powder, then they should be OK. Remove from the oven and allow to cool completely before attempting to remove them carefully from the tray. The tuiles keep pretty well in an airtight container and if any fall apart or get broken, then they’re still delicious sprinkled on ice cream. I admit that’s not much of recipe – in fact, it’s more of an excuse for my annual piece of blogging self-indulgence: My Favourite Bits Of New Music That I've Listened To While Cooking This Year. (I've really got to think of a snappier title). This year I've particularly enjoyed the strangely addictive ‘Human Don’t Be Angry’ album or, for sheer quality, Karine Polwart’s ‘Traces’ and The Staves ‘Dead & Born & Grown’. But they’re not really the music that I choose for cooking. That has to be joyous pop and this year nobody’s done joyous pop better than those young whippersnappers from Oxford Alphabet Backwards. Their first album ‘Little Victories’ was released this year. Miniature Dinosaurs were also helpful at times of difficult baking this year. Their ‘Turn It On’ EP was released in November. And sadly there are occasions when I just can’t resist singing very badly in the kitchen. This year’s song that forced the neighbours to close all their windows and doors is ‘Penitentiary’ by Houndmouth. (This band also wins the ‘most significant beard on a drummer’ award). Their first EP, just called ‘Houndmouth’, was released in August. OK, that’s enough musical indulgence – pass me some cake and a refreshing kir. What’s the difference between confit d’oignon and onion marmalade? The answer is: one of them is French. 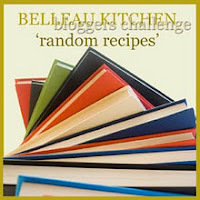 For this month’s Random Recipe challenge Dom of Belleau Kitchen has asked us to select a recipe at random from ‘a book or books you received for Christmas last year’. Now this is a bit of a problem for me because I pretty much gave up the Christmas presents thing quite a few years ago. Looking through my cookery book shelves, though, I came across a book that I seem to remember buying at a charity Christmas fair a couple of years ago. I hope that will do. ‘The Paris Café Cookbook’ by Daniel Young, published back in the 1990s, is actually an American book. As far as I know, it was never published in the UK and it was probably donated by one of the many US expats who live around here. The book is a guide to the French capital’s cafés and a selection of the recipes you might find there. The randomly selected page took me to the Café de l’Industrie and a recipe for confit d’dignon made with red onions. This is a very appropriate recipe for the time of year since confit d’oignon is consumed in large quantities at Christmas time in France. Of course, you don’t need to follow the French Christmas tradition and serve this alongside foie gras; it will sit very happily alongside many different meats, pâtés, poultry and cheeses. To be honest, this is pretty similar to many other onion marmalade and confit recipes but, like a number of other French recipes I've come across, it adds grenadine to the mix, which gives not only a pleasing sweet and sour flavour but also a fantastic colour. I confess that I've changed the quantities a little and lengthened the cooking times. I've no excuse really; it’s just that I like very soft, melting onions. Depending on how much you reduce the confit, this will fill around 2 standard jam jars or 4 smaller jars. Peel and slice or chop the onions quite finely, although a little variation in size will be no bad thing. A food processor will make this a lot easier, of course. Heat the oil in a saucepan and add the onions. Fry gently with plenty of stirring until the onions are thoroughly softened. This will take at least 20 minutes, but shorten this time if you prefer more texture in the finished confit. Pour in the wine vinegar and the grenadine and bring to the boil, while continuing to stir. Add the sugar and stir to dissolve. Bring back to the boil and boil for 10 minutes. The confit will thicken, but there’s no real need to worry about a setting point as you would with jam. Stir in a generous seasoning of salt and pepper. Allow the confit to cool a little before pouring into sterilised jars and sealing. Et le tour est joué, as they say in Paris. The confit will have pretty decent keeping qualities, but I think it’s best stored in the fridge and used relatively young. The Café de l’Industrie is still very much in business and you can find it on the corner of the Rue St-Sabin and Rue Sedaine not far from the Bréguet-Sabin metro station. Pudding pie is an ancient dish from Kent that is traditionally made during Lent but, believe me, it tastes lovely at any time of the year. In fact, what could be better than a pudding in a pie crust? Actually, this is a bit of a twist on the classic recipe that I'm entering in the grand final of the Best of British blogging challenge, sponsored by New World Appliances. The details of the challenge can be found on The Face of New World Appliances and the final is being hosted by London Unattached. For the Best of British final we can choose any area of the country we fancy and I felt strangely drawn to Kent and its fine produce. A plain pastry (usually shortcrust) is used for this dish most of the time but I wanted to celebrate the wonderful cobnuts grown in Kent by using them in my pastry. In case you’re not familiar with them, cobnuts are a form of hazelnut with a long and illustrious history in Kent. I once asked a cobnut grower what the difference was between Kent cobnuts and imported European hazelnuts. His answer was: ‘Hundreds of years of careful growing and the English Channel’. Most cobnuts are sold green and fresh these days and very lovely they are too, but at this time of year some stored nuts are available and can be shelled and ground for baking. Before grinding them you can enhance the flavour by lightly roasting the shelled nuts for around 30 minutes at 130°C (but be careful to avoid burning them). If you don’t have access to the glorious cobnuts of Kent, then you can, of course, use hazelnuts. Either way, grind the nuts quite finely and ensure that there are no lumps. It’s traditional to add dried fruit to the pudding pie but, at this time of year, the apples and pears of Kent are excellent and I used a Kent Conference pear instead. Frangelico liqueur, however, is neither British nor traditional but it does work really well in this recipe. If you don’t want to add alcohol, a little hazelnut syrup would be a good alternative. First make the pastry. You can do this either by hand or in a food processor. The processor will be quicker but be careful to avoid overworking the dough. Put the ground cobnuts in a bowl or processor and sift the flour over them. Add the cold butter and either rub in by hand or pulse in the processor until thoroughly combined and the mixture turns to crumbs. Stir (or pulse) in the sugar. Add the egg yolk and mix in briefly. Add the water in ½ tablespoon amounts and work in (or pulse) until the mixture comes together in a soft but cohesive dough. (You may not need all the water.) Wrap the dough in clingfilm and chill in the fridge for at least 30 minutes. Lightly butter a loose-bottomed cake or flan tin of around 23 cm diameter. Roll the pastry out and line the tin. (It’s not particularly robust, so handle it carefully.) Trim off any excess pastry and chill the lined tin in the fridge for a further 30 minutes. While the pastry case is chilling, you can start to make the pudding filling. Add the milk and rice to a saucepan and bring to a boil while stirring frequently. Allow the mixture to simmer very gently until it thickens – this should take no more than 2 or 3 minutes. Remove from the heat, cover the surface with some baking parchment or greaseproof paper and set aside to cool. Preheat the oven to 170°C. Line the chilled pastry case with baking parchment and fill it with baking beans. Blind bake in the oven for 15 minutes. Remove the beans and parchment and return the tin to the oven for a further 3 minutes to dry the base a little. The case is now ready for the filling. While the pastry is baking, you can finish making the filling. (Use a stand mixer for this stage if you have one – it makes the job a lot easier). Place the softened butter and the caster sugar in a bowl and beat thoroughly until the mixture is very pale and fluffy. Gradually whisk the eggs into the butter and sugar mixture. The filling may not look too promising at this stage, but trust me. Add the cooled rice and milk mixture, the lemon zest and the Frangelico and whisk the whole lot together thoroughly. Pour the mixture into the blind-baked pastry case and scatter over the pieces of pear, pushing them lightly into the filling. Bake in the oven for around 40 – 45 minutes or until the top is golden brown and the filling feels reasonably firm to the touch. (It shouldn't be too firm – a little wobble is a good thing in my view). Let the pudding pie cool in the tin for at least 10 minutes before removing and allowing it to cool completely. Although the pudding pie can be served hot or cold, I much prefer it cold, possibly with a spoonful of crème fraîche (not especially British, I know, but the Channel tunnel is in Kent too). Contrary to rumour I didn't spend the entire 1980s listening to the Psychedelic Furs and Immaculate Fools, wearing strange clothes and generally making a nuisance of myself - although that might account for most of it. In my spare time I also kept some notebooks full of recipes and various cooking adventures. I recently came across these carefully compiled archives at the back of a cupboard. Skimming through them, I quickly realised that they weren't as carefully compiled as I’d thought. Some of the recipes are precise but in other cases it can be difficult deciding what on earth I was on about. One of the notes that caught my eye relates to a Michael Smith recipe for pork. Oddly enough, I've already posted a tomato and plum soup based on one of his recipes but I couldn't resist this one as well. I've adapted the recipe a fair bit – the original dish was essentially a stir-fry - but it’s still based on the taste combinations of the original. Michael Smith was a great champion of English food and, although at first sight this dish may seem to have a distinctly eastern influence, these flavours have been around in English cooking for a very long time. It’s a simple, midweek supper kind of dish that can be served with noodles, rice or mustardy mashed potatoes. It doesn't look too great in the picture but I promise that it tastes much better than it looks. It will serve 4 people. Put the cider in a pan on a high heat and reduce by half. Set aside. Preheat the oven to 170°C. Once the pork is tender, remove from the oven, skim off any excess fat and, once again, add a little water if the sauce seems too dry. Use a hand blender to whiz up some of the apple slices and create a thick, coating sauce. Adjust the seasoning and serve. If you happen to have a copy of the 'Mirror Moves' CD then it might accompany the dish particularly well.